I have decided! The destination for the Second Lagataw Invitational Climb is Bakun, Benguet! I’m planning to organize a BAKUN TRIO (Tenglawan-Kabunian-Lobo) Expedition from April 21 to April 24. (Holy Thursday to Easter Sunday). The budget is 2k-2.5k per person depending on the rent for the monster jeep! 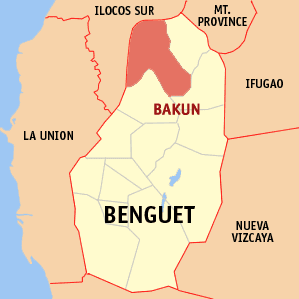 The town of Bakun is in the northwest of Benguet. It is bounded by Mankayan, Benguet on the east and Ilocos Sur on the west. It is 86 km away from Baguio City. This town of Benguet is difficult to access. If you want to use public transportation, there are two daily trips to Sinacbat (the jumpoff to Mt Tenglawan) at the Trading Post (KM5). The trip to Sinacbat takes about six hours. As the bus turns off the Halsema Highway at Sinipsip, the road gets bumpy and dusty! The highlight of the Tenglawan climb is the carrot rock. This resembles Pico de Loro’s monolith. Only, it looks as if it’s about to fall! It juts out of the surface at an angle of around sixty degrees to the horizontal. There was a metal cross fixed on top of the carrot rock when I climbed it in 2008. The hike up Mt Tenglawan is not very taxing. It’s probably just like climbing up Tarak Ridge from Papaya River. Me and my buddy Alvin Evangelista didn’t rely on water sources, although, we saw a clear brook on the way to the summit. The descent from Mt Tenglawan to Bakun dam is breath-taking and precarious at the same time. The views as one approaches the chasm that divides Tenglawan and Kabunian will remind you of the New Zealand you see in movies! The wall of Kabunian which backdrops the verdant plateau near Tenglawan is lined with long waterfalls. My guide in Mt Tabayoc showed me a video on the Legend of Kabunian. It talks of a man (or a god) who got fixed to the boulders of the mountain whose ‘lingam’ turned into a fountain of healing water! Or something to that effect! The final descent to the dam is one of the steepest I’ve experienced. 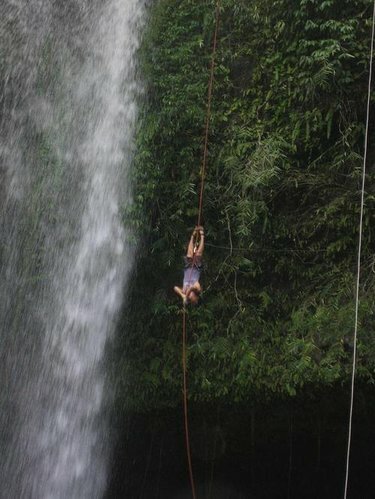 There’s a rope on the near-vertical trail of loose pebbles but I hope this is enough to make you overcome your vertigo! I can’t vividly describe the scenes in Mt Kabunian cuz we trekked it at night! But from the fence that lines the trail I could tell that it is even more vertiginous! The photos of others who have climbed Kabunian are spectacular! This is the best place to practice your skill in nature photography! The last leg of the expedition is Mt Lobo. This is the easiest of the three and can be trekked in a day. It’s an open trail so we'll need cover against the sun! I want to limit the number of participants to just sixteen carefully chosen individuals. A lot of friends have been making reservations but I can’t guarantee any slot. I require training climbs before the expedition. I’m sorry if I have to disqualify some of you! I reiterate, I DON’T REQUIRE FEES! I JUST REQUIRE SPEED, ENDURANCE AND GOOD MANNERS! TRAINING CLIMBS are scheduled on the first three weekends of April. Participants should attend at least one of the three. I am very much hoping that I could provide an event shirt for this. AND THE SHIRT IS OPTIONAL. It’s expensive! So I discourage you from buying it! And for those who attended the First Lagataw Invitational Climb, I really hope I could have the shirts made before the Second Lagataw Invitational Climb kicks off! And so the first leg of my Lagataw Adventure Series has just been completed. I climbed Mt Pulag (the highest elevation in the island of Luzon) in a day’s hike via Akiki-Ambangeg route. That was actually not just an Ultimate Pulag adventure. My Day 1 (Saturday) commenced at KM 54 along Halsema Highway up to the summit of Mt Timbak (the third highest mountain in Luzon) then down to Kabayan Barrio and Kabayan Central where I spent the night! Day 2 (Sunday) was the actual Ultimate Pulag climb. 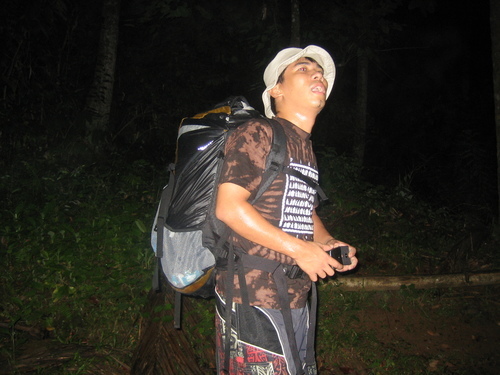 This was actually my sixth time in Mt Timbak and my fourth climb up Akiki and down Ambangeg trails. 0630hrs: Tapsilog @ 456 Restaurant (Session Rd.). 1230hrs: Lunch @ the store across from the Timbak mummies burial rock. 1320hrs: Resume trek. Took the wrong road to the right...Wasted 45 minutes. You’ll know when you’re on the wrong trail if Kabayan barrio is no longer in sight below. At a fork, you should take the road to the left, five meters after which, you’ll see a ‘gate’ that blocks the road. Just go through it. 1710hrs: Arrival @ Kabayan Lodge (Kabayan Central). Check in overnight. Do some grocery shopping. Have your dinner at any restaurant around. They stay open ‘till 8 pm. Place your orders at any (for breakfast) at night. When you say ‘breakfast at 0530’, you’ll have your breakfast no later than that time! 0530hrs: Breakfast at the restaurant beside the lodge. 0620hrs: Start trek to Akiki Trail trailhead. 0650hrs: Arrival @ the trailhead to Akiki. Register. I was going to trek without a guide but that would have been very irresponsible (and pasikat) of me, so I decided to get one. 1500hrs: Arrival @ DENR Visitors’ Center. Log out. Chat with fellow hikers. Wash up. I had the option to hitch a ride to Baguio but I was running low on cash. Couldn’t monitor my expenses…forgot that I still had to buy my bus ticket from Baguio to Manila. I had some amount transferred through LBC but by the time I got to Baguio, LBC branches would have already closed. So I decided to have a good night’s rest at the Visitors’ Center. 1. There are a lot of non-mountaineers in Mt Pulag. It’s funny how they talk and exchange malicious remarks against each other when one gets someone else’s ‘wash-up’ water, and when somebody jumps the line (among other comically tense and yet trivial scenarios at the Visitors' Center). They don’t possess this mountaineers’ ‘forgive them for they do not know what they are doing’ rule of thumb. 2. I’m starting to think there is no such thing as ‘pasma’. I followed Sir Rheys’ advice and I didn’t feel the vibrating abdominal muscle sensation (to think that this was an even more arduous activity than my Mt Pulag Invitational Climb two weeks before). 3. There is a reason why hikers shouldn’t climb fast. Exposing your body to rapidly fluctuating temperature and barometric pressure doesn’t sound like a very good idea. Do what I did and your body will tell you what I mean. 4. These lessons will decide how the remaining nine on the list (of my Lagataw Adventure Series) will be executed. It started with a determination followed by a promise, and everything unfolded like clockwork. From my holidays in Cebu, I headed for Leyte on January 2. I was supposed to do another traverse climb in Alto Peak but Eugene Artiaga and Jhoc Nalda of the newly established Eastern Visayas Mountaineering Club (EVMC) talked me into joining their exploration climb in a mountain bordering my hometown Carigara and Kananga. That was my first exploration climb. There was no trail and we had to do some bushwhacking! At one point, Jhoc accidentally touched a snake (believed to be one of the most venomous in the area) while we were grappling with the weeds and the loose steep ground. On a terrain like this, you have no time for balance and stability. You gotta crouch and leap like a puma with every contact between your shoe and the ground. Otherwise, you’d be climbing three steps up and sliding six down. I was lucky I was right behind Jhoc. The three on the rear had to either take another course or negotiate with the already slippery slope the lead pack trod on! That was already the 3rd of January and I realized I only had two more nights before my flight back to Manila. I was worried that I wouldn’t be able to dry my tent, clothes and shoes so I decided to leave the group at the campsite they found and spend the night at our guide’s place instead. It was mighty windy that night that my clothes and shoes got dry by the morning after! My lamparilla-lit socials with our guide was another evening for learning and discovery. The place is infested with communist insurgents! When you climb a mountain in that area, you’d be beset with these suspecting gazes. You’d have to be very cool to get rid of this extra caution in the air from the locals. It’s even worse when there are military personnel present! They’d most often take you as spies or ‘friendlies’ of the communists. The Cebuano-speaking community of Kananga is a bunch of nice warm people compared to the Waray-speaking Leyteños on the other side of the mountain range. Once again, it was not the climb but my immersion into the community that added flavor to my journey! Immediately on the weekend that followed my arrival in Manila, I traversed Mt Pico de Loro (for the third time) with the Cavite contingents of my Lagataw Invitational Climb. It was the first time I met the group of Ryme Bristol whom I had met only in pinoymountaineer.com. Another online buddy Janielle (Jan) Leaño joined the ‘traverse’ day hike. The only familiar face was that of JR who had earlier joined me on a trek in the same mountain. Leading a pack of strangers (and beginners) is both exciting and fulfilling! You are all excited to know who and what is who! At first some would be intimidated (or so I assumed) knowing that you have a list of achievements to your name. And slowly they’ll realize that this person that they look up to is, after all, just as ordinary as they are, or even less. From an ‘idol’, you become an equal then you become an inspiration to ordinary people telling them that they too can make it! Nothing is more fulfilling to me than that! You instill hope, pride and confidence in others because nobody else might as nobody else did (to you)! The weekend after, I accompanied two of my friends up Mt Marami. The mountain has recently started gaining more and more popularity. When I guided a group of new mountaineers from Dasmariñas last November (2010), the trail was good as new! It was covered by grass and the part near the boulders was noticeably ‘untrodden’ for quite a while. The name Mt Marami is eclipsed by the popularity of Mt Pico de Loro. Both mountains are in Cavite and one can be seen from the peak of the other. Both mountains feature boulders near the campsite, but the picturesque view of the monolith of Pico de Loro attracts more mountaineers than the boulders of Mt Marami. What many mountaineers haven’t recognized is the sense of fulfillment once you survived the intricacies of the trails of Mt Marami. On that day (Jan 15), nearly a hundred hikers climbed Mt Marami but only thirty percent was able to make it to the summit. For some reason, most of the climbers used the old (Nuestra) trail. Two of my new friends whom I guided last November guided a different group that day. They were around sixteen and the pacing wasn’t well-coordinated so the group was divided into different sub-groups. The dark hindered them from making it to the boulders. The bearer of the butane gas got separated from the bearer of the food. Two of their members searched for their missing companion and ended up joining me and Manong in our socials over kapeng barako. Chuck Miralles (another friend of mine) who was with his group (ATMC) hired a guide who led them through the Nuestra trail. This trail terminates at the foot of the boulders where their guide left them. Summiting had to involve a precarious rock-climbing up the boulders. From the foot of the boulders Chuck texted me “Tol kayo ba yang naririnig ko sa taas?”. And Chuck gauged the danger of climbing up the boulders. And after our hand-shake at the peak, he headed back down before the sun disappeared in the horizon. They decided to camp at the foot and called off the plan to summit. In our case, I took the new trail with my friends (for the fifth time). And we were lucky to witness the spectacular sunset views of the mountain that time. After taking pictures at the peak, I packed my already pitched tent because my friend wanted to join the socials at the chapel. It was such a perfect decision because the rain poured heavily and lengthily that night! You wouldn’t wanna deal with the deep mud down the long trail the following day. We shared the campsite (Nuestra) with two other groups. In my case, I slept at the caretaker’s house after our socials and found my tent filled with rainwater the next morning. My Coleman Pioneer 2 finally retired! And so my climbful January has ended. But it ushered in an even more climbful February! This month kicked off with the First Lagataw Invitational Climb at Mt Pulag (Akiki-Ambangeg) which was followed by another Pico de Loro traverse day hike on the second weekend. Tomorrow night, I leave for Benguet for a double traverse double day hike to start my Lagataw Adventure Series. Catch y’all on Monday! The First LAGATAW Invitational Climb has just been concluded. 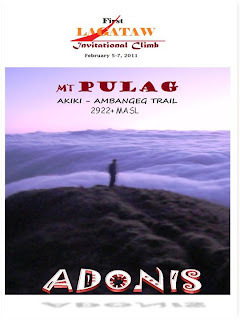 I organized twelve people (9 Filipinos and 3 Japanese) and climbed with them up the Akiki trail and down the Ambangeg trail in Mt Pulag last Feb 5-7, (2011). 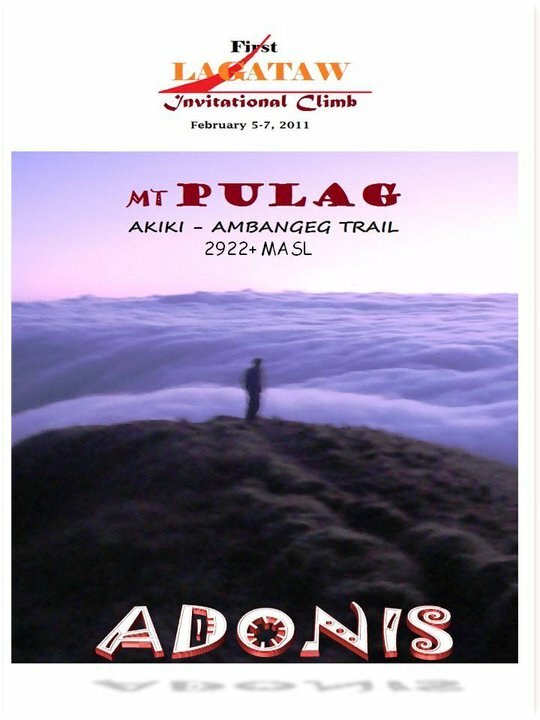 The invitational climb was graced by the presence of Sir Melo Sanchez, another experienced climber who has been popularizing The Luzon 3-2-1 three-peak expedition. My third time in the Akiki-Ambangeg trail was a climb of many firsts for me. It was my first time to organize a major climb. It was the first time I climbed with my Facebook buddies Migs Castillo and Melo Sanchez. It was the first time I climbed with my younger brother. It was also the first time I met my multiply.com buddies Emman David and Ivan Basio of High Conquerors, Billy Morales of Katuga Mountaineers, and Andrew Amolar of OLAY mountaineers. I have always preferred to climb with a few companions if I’m not alone. It makes the journey faster and the itinerary very flexible. But this year, I have become more open to group climbs. Most of my climbs now are revisits to the mountains I’d climbed with few people before. Revisits are not for adventures and testing limits. They’re basically for fun purposes and fun is intensified with more people involved. As an organizer, it is also a test on how well you can keep a group united and safe and how you can manage to make strangers find new friends or special someone (in Mig's case). In these aspects I think I fared well. The group was composed of three Japanese and twelve Filipinos. The Japanese guy (Takahiko Matsuda) had climbed mountains in Indonesia, Japan, Tasmania and Patagonia. Mari Karakawa had already climbed Mt Fuji and a 4000+ masl mountain in China. Midori Nakao had never climbed a mountain before but she was the lead in the tail pack which the members agreed to call Team Midori! Melo Sanchez has Luzon 3-2-1, sleepless G2 traverse and Mindanao 3-2-1 under his name among other feats. His companion Cham Derige is also a seasoned climber who belonged with us in the lead pack. Eric, my friend from college was still as indefatigable as when he joined me in my first ascents up Mt Timbak, Mt Pico de Loro (traverse) and Mt Amuyao (traverse) in 2006. My brother Emir was surprisingly strong as he was always in sight behind me up Akiki and down Ambangeg. I thought it would be tough for him because when we jogged the weekend before the climb, he got tired after a 2K run. Little did I know, he walked home (in Alabang) from his workplace (Alaska in San Pedro, Laguna) on the days that followed. Miguel Castillo (a fellow Waray) my Facebook buddy, had this heavy pack but his experience in climbing mountains in Luzon, Visayas and Mindanao was attested to by his speed and vitality. The tail pack (Cherie, Ryan, Ryme and Butch with Midori) were just fifteen minutes close to the lead pack. Butch Digao probably had the heaviest backpack among us. He was carrying the supplies for him and his girlfriend but he never tired of cracking jokes and making the pack laugh. Ryme Bristol was the glue in the members of Team Midori. 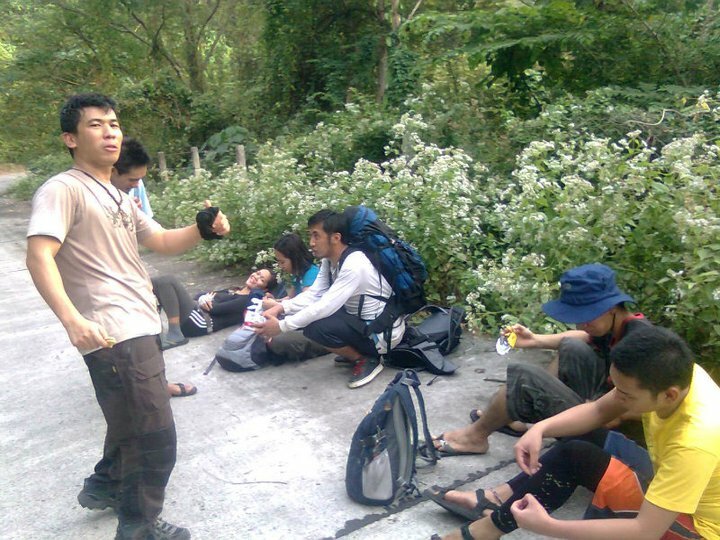 Less than a year into the mountaineering world, Ryme has organized climbs around Calabarzon area with his friends. I met Ryme in a thread on Mt Marami in pinoymountaineer.com. I guided him and his friends from Cavite (Butch, John, Ryan, and Cherie) on a traverse day hike in Mt Pico de Loro early last January as a training climb to our Mt Pulag climb. These people are the reason why the First LAGATAW Invitational Climb became a success. The same reason I’m drafting the Second Lagataw Invitational Climb (probably Mt Guiting-guiting)! It is not easy to organize a major climb. You have to adjust the time of the climb just to accommodate the most number of participants and at the same time trim down the climb size in order to minimize the impact on Mother Nature. In addition, when you fail to collect confirmation fees, you’ll have to make a lot of adjustments as participants back out at the last minute. Above all, you have to set the budget low in order not to be counted among those unscrupulous organizers who only care about profiting from the newbies and the less-informed. Indeed, it’s not easy to organize a climb but it is FUN and FULFILLING knowing that you have shared!